Today is Losar, the first day of the Tibetan Buddhist New Year, the year of the Female Wood Sheep. Losar is always the day after a particular New Moon, which was yesterday evening. Religion and worship is one area where we agree to differ and where people find their differences. “Freedom of religion” to me means that what is sacred to you is sacred to me, i.e. not “what” you consider as sacred (not your particular religion and rituals), but the fact that you consider these sacred. The actual religion, rituals, and objects that you consider sacred are not necessarily the same religion, rituals, and objects that I consider sacred, but the fact that you consider them sacred, “that” fact is sacred to me, provided that it does not harm others. I feel the same about the many different forms of Buddhism. 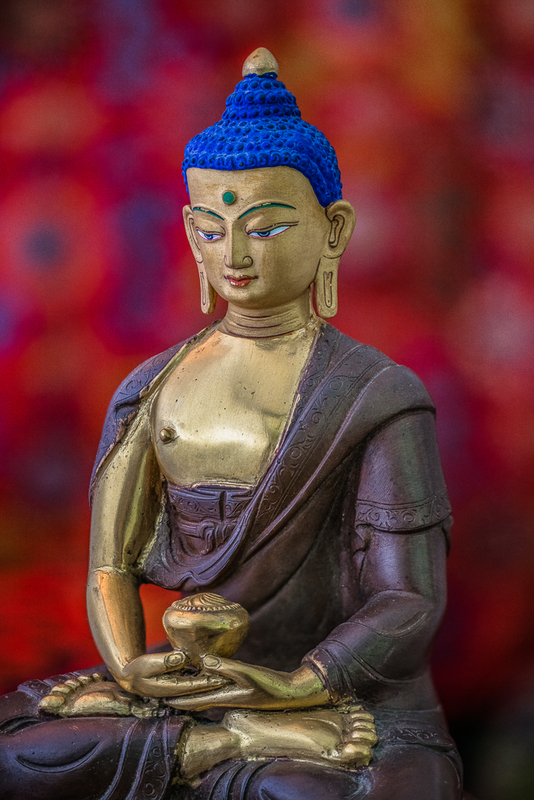 Not all forms of Buddhism are identical; far from it, but they are mostly the same. What is exactly the same in all forms of Buddhism is “The Dharma” upon which they are based. So we might ask, what is the difference between Dharma and Buddhism? Well, the simple answer is that there is a big difference. There is one Dharma and many forms of Buddhism. In other words, there are many views or takes on the Dharma (just what it is), which accounts for the many types of Buddhism. The Dharma is based on natural law itself, from which the historical Buddha developed a method to use or work with natural law to enlighten ourselves. Your or my take on “The Dharma” (or this or that form of Buddhism’s take) is, well, just that, hopefully a clear take. Yet there will always be some subjective component to what we are calling a “take.” We each (and it is the same with the different sects of Buddhism) put the Dharma into words that make the most sense to us. Thus there are differences. My particular Buddhist lineage is a Tibetan view, and one of several Tibetan Buddhist lineages at that. And there are differences. Otherwise there would be no different lineages, but just one. This is not to deprecate any form of Buddhist worship (or any lineage of Buddhism), but only to point out not to confuse the Dharma itself with any of the many views or representations of it. I won’t say the “baby with the bathwater,” because your or my take on the Dharma deserves more respect than that. Make no mistake. It is the Dharma itself that all forms of Buddhism respect. Separating the Dharma from the particular form of Buddhism that holds the Dharma as true can be a slippery slope (or a touchy subject), but all types of Buddhism agree on the Dharma more than (perhaps) they agree on any one particular view (or way of worship) of the sacred dharma. We can relatively respect others views, but we absolutely respect our particular group’s view. See what I am getting at here? To repeat: it is confusing to try to make something that is relative to us, absolute. For example, I have been taught that any image of the Buddha, no matter how crude, must be treated with respect. And all respect for the Buddha is respect for the Dharma. The Dharma is based on the natural laws (the way things are) that the Buddha himself discovered and treated with respect, and those laws existed long before the historical Buddha. All lineages, all forms of Buddhism, are based on the Dharma and nothing else. If they differ, it is not the dharma that differs, but the different views each form of Buddhism takes of the Dharma. Organized religion is just that, an attempt to organize what is essentially unorganized by nature, usually with mixed results. We may not agree with the different rules, takes, sects, or the practices of various Buddhist groups (or with those who run them), but all forms of Buddhism are based on one thing only, The Dharma. The Dharma is how the historical Buddha used natural law (the way things are) to enlighten himself and he shared that method with us. That method is what we call The Dharma, and the Dharma takes into account natural law. I was taught that we don’t break nature’s laws. They break us. It is no wonder that the Dharma, which is a method of enlightenment based on pure natural law, is respected. To not do so is a form of suicide.